The Badlands, Black Hills are some of the natural beauty within this state. 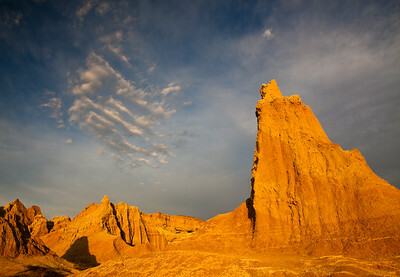 On the Sage Creek Road drive, the clouds were building over "the Wall" of pinnacles and spires that give the Badlands it's name. Ben Reifel, a Lakota Indian born on the Rosebud Indian Reservation near Parmelee, Todd County, South Dakota was the first person of Sioux ancestry to serve in the Congress and the only Native American in Congress throughout the 1960's. 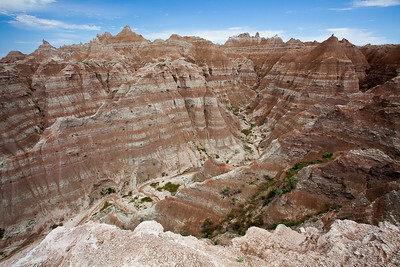 The visitors center in the Badlands is named in his honor. This is from an area near the Visitors center. I've been posting a bit out of sequence - time wise. 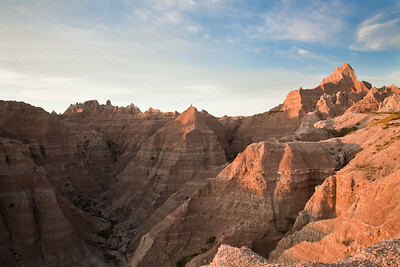 This is actually the fourth frame I took on the first day's sunrise while in the Badlands. This was a short lived sunrise as a storm quickly developed, and just as quick, passed, leaving the rest of the day one of great clouds and sunshine. 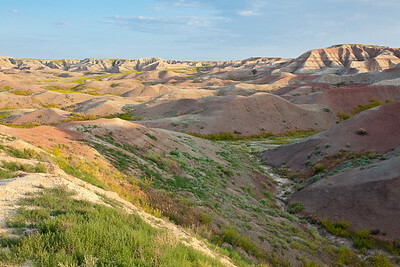 The Badlands offers a wide variety of landscape textures and colors, from gray lava deposits to black minerals from an earlier era when this was the bottom of an ancient sea floor. 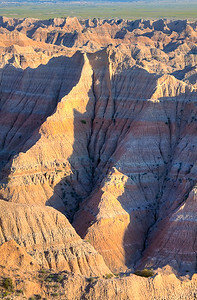 Here, near the Yellow Mounds Overlook, the gentle hills can be deep purple reds to golden yellow. As the sunset approached, it looked like it was going to be one of the most magnificent sunsets I had ever seen, Unfortunately within an hour, it looked more ominous than any storm I have ever seen. 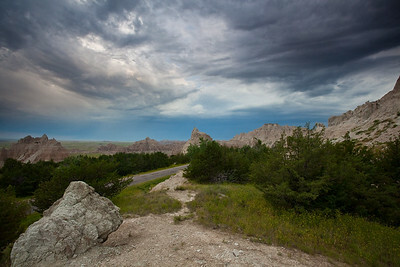 The sky clouded over with black clouds and the 25 mile ride down the winding roads of the Badlands Loop was filled with lightening and high winds more fierce than anything we experience in Illinois. It was quite a ride! 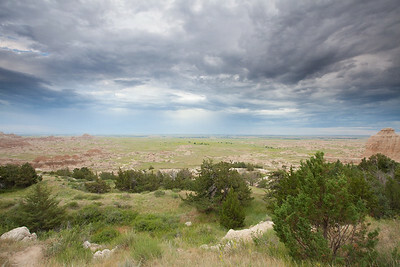 It turned out to be one of the most aggressive storms this year in the Badlands. 2458.1 miles later, we are finally back home! Broadband access was a challenge everywhere we went, so I did not post too many pictures from the trip. This is an image from Norbeck Pass - a stunning view from the overlook - really does not give a sense of scale, but these spires are quite tall - at least several hundred feet tall. 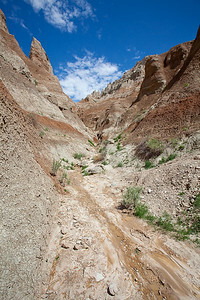 A canyon along the Badlands Loop after an evening rain storm. The scenery at the Park entrance is amazing - at first you see very little and then suddendly the pinnacles appear, leaving you awe struck. 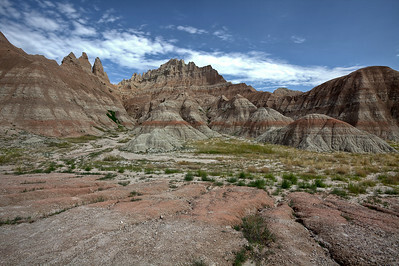 Near Cedar Pass Lodge the Badlands Scenic Loop begins. This is an area near the begging of the loop. 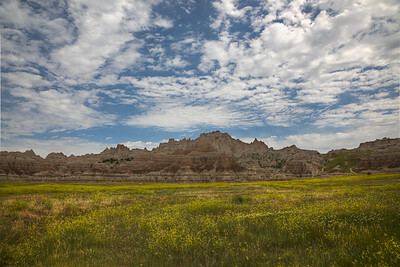 This was a particularly good year to be at the Badlands, which was unusually green due to lots of rain this year. 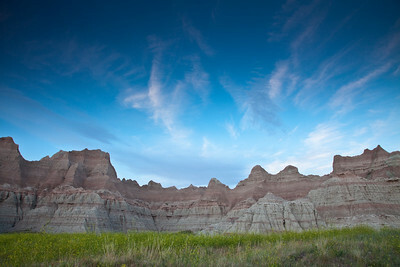 This is one of the first images from our trek to South Dakota. 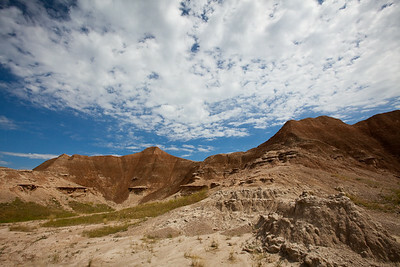 The landscape started to change as we approached the Missouri River Valley. 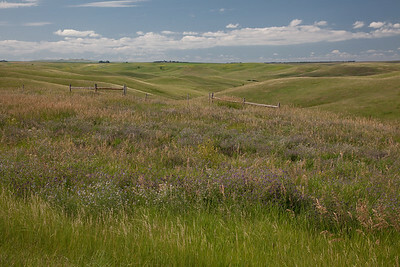 After we crossed the river, we were treated to views of gentle rolling hills and prairie as far as the eyes can see. 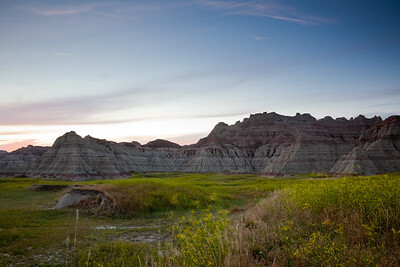 One can quickly understand why this area is called the Great Plains. Every few feet the car was echoing with "Wow" as each of us saw another beautiful vista. I had to pull over and capture at least one view of these Great Plains. One of the most spiritual experiences I've ever had, was sunrise at Panoramic Point . Alone, I stood at the top of Panoramic Point, listening to the cooing of Morning Doves throughout the Pinnacles. A Rabbit approached and calmly walked around me, eating the short, sparse grasses as I composed images. I truely felt at one with nature at that moment. It was difficult to leave this place, the memory of which, I will carry forever. 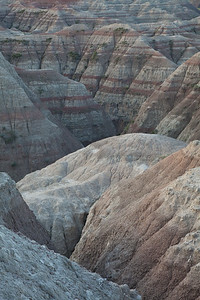 I could easily spend a lifetime exploring the Badlands and never really capture all that is there to experience. 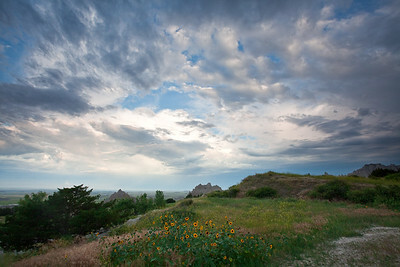 Our stay in the Badlands has been stormy - sometimes great for dramatic skies, but often missing the magic hours. I have many more images to post, but have had a VERY hard time finding a reasonable broadband connection. 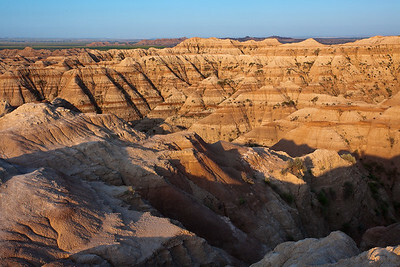 last night, in particular took us to an incredible overlook, but as the sunset approached - a storm came up - we made the 25 mile ride back to the lodge with lightening flashing off the hoodoos surrounding the Badlands loop - it was quite a ride!!. Thanks for stopping by to share the experience. 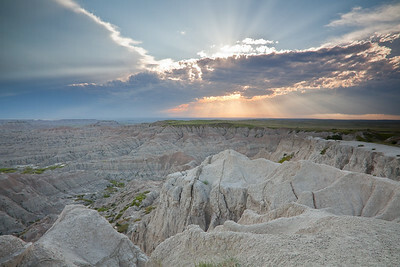 1st sunrise in the Badlands was short lived - a storm was brewing in the West, moving fast. The blue near the horizon was actually a deep purple blue. The forground clouds were starting to swirl and I realized it was proibably not a good idea to be as far away from the car as I was, since there was no straight, flat route to it. That and the posted warnings about poisonous snakes was enough. I stopped shooting and worked my way back to the car to head back to the motel. Got there just in time for the storm to break. Too bad, I was looking forward to some lightening strikes over the hills! The storm turned out to be short lived and the rest of the day was picture perfect. 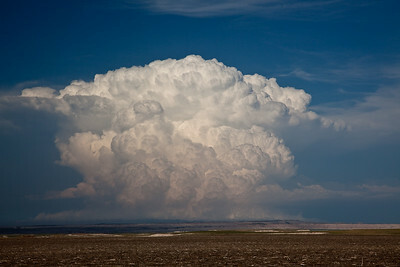 - just enough clouds to keep the sky interesting as the strom moved off further east.